Since last decade, biologically inspired optimization techniques have been a keen interest among the researchers of optimization community. Some of the well developed and advanced popular algorithms such as GA, PSO etc. are found to be performing well for solving large scale problems. In this chapter, a recently developed nature inspired firefly algorithm has been proposed by the combination of an efficient higher order functional link neural network for the classification of the real world data. The main advantage of firefly algorithm is to obtain the solutions for global optima, where some of the earlier developed swarm intelligence algorithms fail to do so. For learning the neural network, efficient gradient descent learning is used to optimize the weights. The proposed method is able to classify the non-linear data more efficiently with less error rate. Under null-hypothesis, the proposed method has been tested with various statistical methods to prove its statistical significance. In context to the combinatorial optimization algorithms, there are two types of optimization techniques those have been a keen interest among the researchers such as complete and approximate algorithms. Complete algorithms are the earlier developed algorithms and are quite efficient to discover the solution of the problem. But, the limitation of this approach is the infinite amount of time required to compute the solution. So, the main focus leads towards the meta-heuristic algorithms among the other approximate algorithms, which are able to get the optimal solutions considerably in short span of time. Due the factor of non-requirement of gradient information in meta-heuristic method, they are more efficient than simple gradient decent methods. The major working principles of meta-heuristic algorithms are exploration and exploitation (Pal et. al., 2012). Exploitation is the searching of best solutions among the neighbors and to extract the information, where as exploration is the procedure of searching the various solutions in the search space. As firefly algorithm is meta-heuristic in nature, so its search process overcomes some pitfalls of both local search and randomization at some higher level. i.e. the algorithm produces the best fit solution from a number of newly generated solutions in the search space at lower level and due to the randomization nature, the algorithm does not gets trapped at local minima. Firefly algorithm is a nature inspired stochastic meta-heuristic optimization designed by X.S. Yang (2009) at Cambridge University. The algorithm is stochastic in nature, i.e. it randomly searches the solutions in the search space. Due to the random nature of the algorithm, it avoids to the trapping conditions at local minima. The crossover and parameter tuning nature make the algorithm more efficient. While crossover ensures the same or equivalent solutions to be shared among both the parent and child, the proper parameter tuning in the algorithm helps to balance the tradeoffs between the exploration and exploitation. Among two thousand species of fireflies in the nature, most of the fireflies produce flashing lights through a biochemical process called bioluminescence. The light patterns of each individual species are unique and through it, they attract their neighbors. Sometimes the light patterns also act as a warning or presence of the firefly to other neighbors. The rhythmic nature of the flashing light, flashing rate and the time span of the light help to attract the other fireflies (male or female) (Fister et. al., 2013). Due to the local attraction of the fireflies, this algorithm is able to subdivide its populations into groups and competently handles the multimodal as well as nonlinear problems. 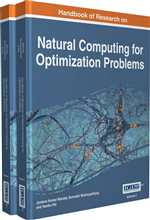 Further details about the principles of the algorithm have been discussed subsequently in this chapter. With the knowledge of Firefly Algorithm and its problem solving approach, in this chapter, an attempt has been made to develop a hybrid non-linear data classification method based on Firefly Algorithm and Functional Link Higher Order Neural network. Although a number of traditional classification methods are proposed by many researchers (Quinlan, 2014; Yung & Shaw, 1995; Hamamoto et. al., 1997; Zhang, 2000; Yager, 2006), for the first time, Zhang et. al. (2000) successfully used artificial neural network (ANN) for classification as an alternative to statistics based classification methods. ANNs are efficient in learning from intricate input and output mapping in nonlinear data to obtain efficient decision boundaries. Many works are reported on various ANN models which make use of a range of learning techniques and its hybridization. As compared to higher order neural network, the classical neural networks (Example: MLP) suffers from slow convergence and fails to automatically determine the best possible model for classification. In the last few years, to overcome the limitations of conventional ANNs, some researchers have focused on higher order neural network (HONN) models (Redding et. al.,1993; Goel et. al., 2006) for better performance.